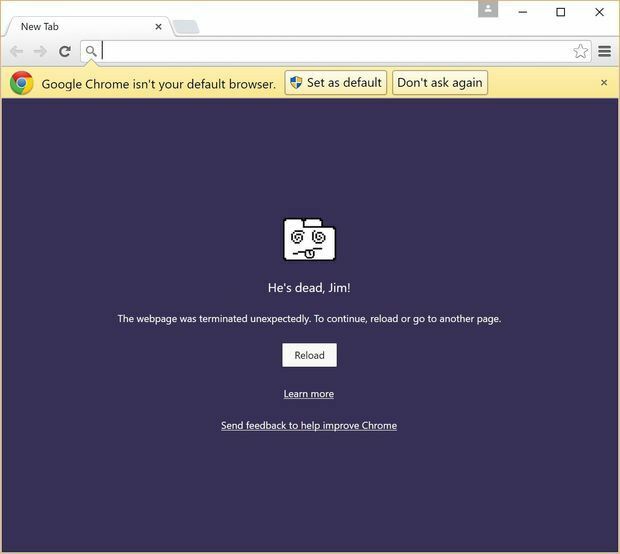 Google Chrome crashes on Windows 10: How can I fix it? What should I do when Chrome crashes on Windows 10? Home » Fix » What should I do when Chrome crashes on Windows 10? Microsoft released quite a few Windows 10 post-RTM build for insiders over the years, but they are still far from bug-free. Reportedly, a lot of users of Google Chrome who are testing the latest build said that the browser just crashes, for no particular reason. Why is Chrome crashing all the time? According to various reports, the 64-bit version of Google Chrome doesn’t work in particular Windows 10 build versions. On the other hand, the 32-bit version works just fine. You can try it yourself, just run the 64-bit version of Google Chrome, and you’ll probably get a crash report and a bunch of error messages. So, why does this happen? Google Chrome uses a special technology called “sandbox,” which isolates the browser‘s processes in order to reduce the vulnerability of the browser, and reduce a chance for malicious software to get to your computer. “Cutting through the noise, it looks like the sandbox is breaking in the Win10 10525 previews for 64-bit Chrome,” said Justin Schuh, a Google software engineer, in one of his messages on the Chromium bug tracker. How can I fix my Google Chrome from crashing? Apparently, some aspects of the latest Windows 10 build conflict with the sandbox technology, which prevents Google Chrome from working on certain builds of Windows 10 for Insiders. So, if you want Google Chrome to work, you’ll need to disable the sandbox feature. This should restore the functionality of Google Chrome in Windows 10, but it takes some risks with it. Namely, when you disable the sandbox feature of your Chrome browser, it will become more vulnerable, and potentially malicious content will find an easier way to enter your computer through the Google Chrome browser. But, if you don’t want to mess with your security in the Chrome browser, you can switch to the 32-bit version, or maybe try another browser, until Microsoft comes up with the solution. And, since this issue is now widely reported, I’m sure that Microsoft’s developers will start working on the solution, along with the fixes for other bugs. If you’re still having issues on your PC or you simply want to avoid them for the future, we recommend you to download this tool (100% safe and tested by us) to fix various PC problems, such as file loss, malware, and hardware failure. In some cases, the “-no sandbox” method is still popular, but remember, it can cause a lot of vulnerability to your browser. If none of the solutions written above didn’t work out for you, try some of the steps listed below. We strongly recommend installing the x32 version of Google Chrome because it’s more stable. Don’t forget to often check for an updated version of the browser. Reinstall Chrome is the crashes persist. Is it possible to auto-hide Address Bar in Chrome?